First time on market in generations! Legendary Pegasus Ranch offers the ultimate in privacy & serenity. This magnificent 45 acre (apprx 17 flat acres) trophy property is located in a sylvan, verdant setting down a long gated driveway surrounded by mountain vistas, private hiking trails, open pastures, magnificent old growth trees & seasonal streams/waterfalls. This property has been a celebrity retreat for many years & has hosted Hollywood's finest. The main house is a remodeled 3 bdrm ranch house w/ gourmet kitchen featuring a Dynasty professional range, granite counters & stainless appliances opening to a true great room/media room w/ soaring wood beam ceiling & fp. Also includes equine paddocks, an apprx 1400 sq ft warehouse w/ 18 ft ceilings, perfect for a future guest house, recording Studio or Barn, as well as a 600+ sq ft, detached garage, storage barn, outdoor theater & Zip-line track. 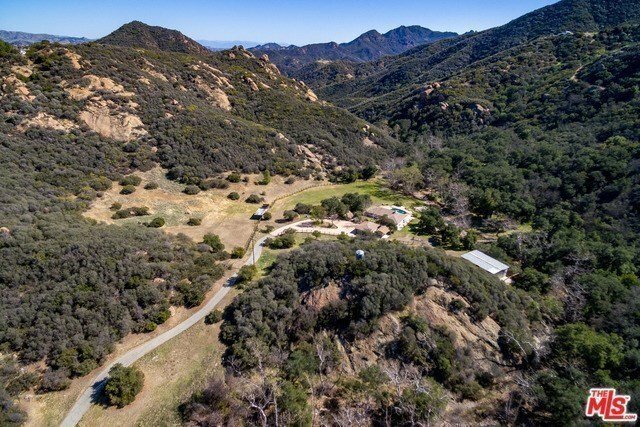 This property is the ultimate retreat, w/ the potential to be a world-class horse ranch.